“Can it happen here? Absolutely. It has happened before. It will happen again. To many Americans, something like it is happening now.” This is the verdict of Harvard law professor Cass R. Sunstein in his introduction to a collection of 17 essays by distinguished professors of law, social science, and psychology. Abuses by authoritarian regimes have happened before in the United States. Geoffrey R. Stone, from the University of Chicago, reviews some precedents. The U.S. Constitution allowed slavery. The Federalists enacted the Alien and Sedition Acts in 1798. President Lincoln suspended the writ of habeas corpus and imposed martial law. Lynchings went unpunished for decades into the 20th century. The 1917 Espionage Act made it a crime to refuse military duty or obstruct recruitment. David A. Strauss, also at the Chicago School of Law, cautions: “If it happens here, it won’t happen all at once. A large, diverse society with democratic traditions and a strong civil society is unlikely to become an autocracy overnight. The more plausible scenario is a gradual erosion of liberal democratic norms. . . . The institutions will have been hollowed out; much of what we value in a liberal democracy will be lost.” Courts have often pushed the limits of existing principles in response to extraordinary circumstances. Donald Trump counts on his instincts as he defies or ignores science. But sociologist-systems analyst Donald J. Watts warns that common sense is not capable of dealing with a complex world with large-scale social and economic problems. Common sense to one group of people in one time and place is not necessarily shared by other groups. Not everything that is true is self-evident. Common sense decision-making is not wired to think about the second- and higher-order effects of policy interventions, for example, withdrawing from the Paris climate accord. Common sense often fails to understand reality because it neglects unconscious biases, background circumstances, and network dynamics. Yes, scientists often err, but decisions on serious matters should start with scientific methods. Columbia University social scientist Jon Elster points to a homology between Trump and Louis-Napoleon, president of France 1848–52 and emperor, 1852–1870. Each aspiring autocrat reveled in narcissism and megalomania. Like Emperor Napoleon III, Trump is reluctant to listen to experts lest they get credit for success. He is likely to fail because political success requires consultation with competent advisers. New York University law professor Stephen Holmes analyzes “How Democracies Perish.” He finds that democratically elected governments can use their constitutional authority to bulldoze democratic institutions and tarnish the idea of accountability to voters, as in today’s Hungary and Poland. Once elected, even by a slim margin, a government can exploit simmering discontent to slander and harass independent media, turn TV channels into propaganda machines, deploy government agencies against internal enemies, and use the law selectively to attack opposition politicians and decrease funds for opposition parties, populate the judiciary with ideological extremists, enrich loyalists by the procurement process, and pass voter suppression laws. Elections become not choices about policy but a way to highlight the differences between “them” and “us.” Populist voters vote to avenge themselves against out-of-touch elites and under-the-radar immigrants. Collective solutions to shared problems are not on the government’s agenda. Despite the Trump administration’s movement on this road, Holmes is relatively optimistic that courts, elections, and widespread devotion to democracy will save liberal democracy in the United States. 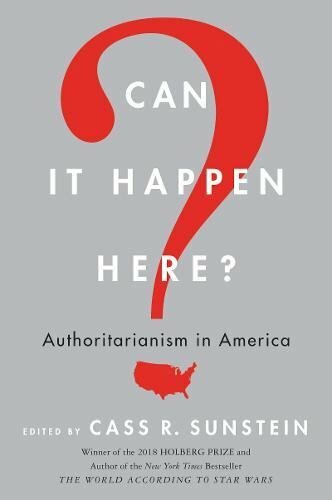 The most hopeful essay in the book is by Tyler Cowen, an economist at George Mason University, who asks: “Could Fascism Come to America?” No, he replies. Not in the kind of America we now have, because our government has become so large and unwieldy. No radical group can control enough of the modern state to steer it in a fascist direction. It is easier to subvert a relatively small and simpler state. One wonders, however, does this proposition fit Weimar Germany as described in Benjamin C. Hett’s Death of Democracy, reviewed in NYJB earlier this year? Or Brazil and Chile in the 1970s? Or Russia under Putin? The book’s most alarming chapter may be “Beyond Elections: Foreign Interference with American Democracy” by Harvard human rights expert and former U.S. ambassador Samantha Power. She contrasts the weak punch of Soviet “active measures” against presidential candidate Ronald Reagan with the scope of recent Russian support for Donald Trump. She documents how Americans’ indifference to real news and their dependence on social media create vast opportunities for foreign bots and trolls to shape public opinion. She notes the failure of Trump’s State Department to expose disinformation campaigns from abroad. Each contributor to this book examines the evidence and the tea leaves to anticipate whether the United States will gravitate further toward authoritarian rule or step back toward liberal democracy. Any reader concerned with this issue should consult the book’s arguments and facts to understand the many factors that will shape America’s political future.